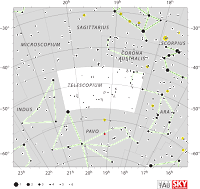 Telescopium is a minor constellation in the southern celestial hemisphere, one of twelve created in the 18th century by French astronomer Nicolas Louis de Lacaille and one of several depicting scientific instruments. Its name is a Latinized form of the Greek word for telescope. Telescopium was later much reduced in size by Francis Baily and Benjamin Gould. The brightest star in the constellation is Alpha Telescopii, a blue-white subgiant with an apparent magnitude of 3.5, followed by the orange giant star Zeta Telescopii at magnitude 4.1. Eta and PZ Telescopii are two young star systems with debris disks and brown dwarf companions. Telescopium hosts two unusual stars with very little hydrogen that are likely to be the result of merged white dwarfs: HD 168476, also known as PV Telescopii, is a hot blue extreme helium star, while RS Telescopii is an R Coronae Borealis variable. RR Telescopii is a cataclysmic variable that brightened to magnitude 6 in 1948 as a nova.